I asked Lexa Rosean, my wiccan high priestess, for another spell. I needed help fast. Four agents were reading my manuscript and I wanted to land a savvy one. Luckily, she got right back to me. For $25, she’d make a custom-designed candle that burns for seven days. I could pick it up that evening – a rush job. To accompany it, I had a choice of “success” bath salts (her personal blend) or “success” incense. I took the bath salts. I hoped the spell would be more potent since I was doing it right before Halloween, the witches’ new year. I was at a critical career juncture. I was asking for a big thing, but I had always believed in rituals. That night I was meeting my partner, Slim, for dinner, so I would be in Rosean’s neighborhood and could pick up my candle at her place. Now I had to buy candy. I bought an inexpensive bag of candy corn. Was I being too cheap in my selection? Did it matter? Rosean’s spells had worked wonders for me in the past. I originally met her at a party in the East Village. An attractive redhead in her early 40s, she is the author of six books of spells. 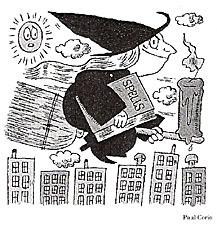 Writing a profile of her for a magazine, I tried a formula from her book “Power Spells.” Since I couldn’t get paid from a publication that had owed me for ages, I cast her “Spell to Collect Debts.” I got both checks within two weeks. My skeptical partner was laughing when I chewed cloves and spit them out the window while shouting, “One hundred dollars, one hundred dollars.” But Slim was impressed when the money came. Rosean liked the profile, saying she thought I really “got her” and maybe it was because we both had religious backgrounds. She had been raised a Hasidic Jew and was “excommunicated” for studying the kabbala. I must have mentioned my traditional Roman Catholic upbringing. This past summer, I asked her for a spell to attract a good next-door neighbor. She sent me an easy herbal recipe. I mixed the herbs and put them into two saucers, which I strategically placed along the adjoining wall. I left the dishes out for weeks while the building management showed the apartment. So far so good. My new neighbors are a quiet middle-aged couple who aren’t around very much. Perfect. The next morning, I got up around 9, had coffee, then walked through the drizzle to East 13th and Third. The day before, I had prepared two plastic baggies – the offerings – and placed them in my shoulder bag. I took out the candy bag and it was kind of gross. The stubby little pieces were all broken or mushy. I did my best to follow the witch’s instructions. Then I returned to my apartment. I ran a bath, added some success salts and lit the candle. I wrote the name of the agent I most wanted on a piece of paper and slipped it underneath the candle. I approached this rite with reverence and attention. My candle was orange with green, red, gold and silver glitter patterns. It reminded me of the large red vigil lights my father lit in church in front of statues of the saints. My parents were always praying, making novenas and cash offerings to various shrines St. Jude, St. Anthony. I did not see my actions as that different, although I knew my Irish Catholic mother would be horrified that I’d visited a witch. I was raised to believe in the power of prayer. When I was growing up, we said the rosary every day so the Russians would not bomb the United States. We followed instructions from Our Lady of Fatima, and the country did not get nuked. I’m a believer in whatever ritual makes sense at the time. I’ve got my special candle burning night and day, and I’m waiting for that agent’s call.